Our Ranga 31 brushed cotton fabric showcases a big and bold navy, blue and white check on a beautifully soft base. Ideal for the cooler months, you'll struggle to get your little ones out of these as they're unbelievably comfortable! 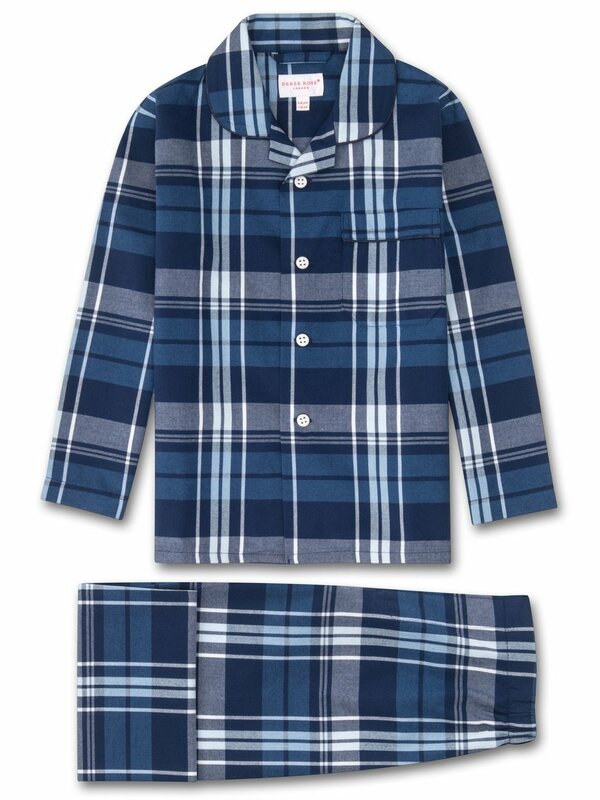 Crafted to keep your little ones looking their best, whether it be for winding down before bed or for breakfast around the table in the morning - we've kept things simple with our kids' pyjamas, with a smart rounded collar with revers, one breast pocket and plain hems on the sleeves. The pyjama top is fastened with buttons and piped in complementary navy, while the trousers have an elasticated waist for comfort and a sealed fly. Crafted from a medium-weight brushed cotton, the Ranga 31 navy pyjama utilises a unique brushing technique to comb and soften the fibres for an extraordinarily soft handle.